Three weeks. 21 days. 500 hours (give or take). That's how long it is until Avengers: Infinity War begins rolling out in cinemas across the world, and you can practically taste the anticipation. But until we get to see all 160 minutes of the movie's impressively long run-time, our sister publication Total Film magazine has you covered with two more exclusive images from the film, and you're going to want to give them a look. Image number one offers our best glimpse yet at the new and improved Guardians of the Galaxy, who will be meeting Thor, Iron Man, and (hopefully) a bunch of other Avengers for the first time in Infinity War. From the looks of it, this is their first introduction to the God of Thunder, and they don't seem too pleased about his unexpected arrival. Could a Thor versus Guardians fight be on the table? 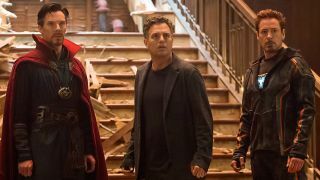 Marvel has certainly been happy to let its heroes duke it out on the big screen before, so maybe a small skirmish is something to look forward to before the Asgardian properly teams up with his new space-faring friends in the fight against Thanos. Next up, it's Doctor Strange, Bruce Banner, Tony Stark, and Wong together in what appears to be Strange's Sanctum Sanctorum, which certainly corroborates with what we've seen from the two trailers so far. If that's the case, the quartet's surprised expressions are likely in response to Thanos' arrival on Earth, along with that cylindrical spaceship Spider-Man is seen climbing aboard in Infinity War's first trailer. Despite their noticeable anguish, it's nice to see all three of the MCU's most famous doctors (or "The Science Bros", as Marvel fan fiction likes to call them) together in one place. Hopefully they'll be able to talk quantum physics and chaos theory once this Thanos business blows over... provided all three survive till the end of the movie, that is. Avengers: Infinity War releases in UK cinemas on April 26, before launching stateside just one day later, April 27. In the meantime, you can read more about the movie in the upcoming issue of Total Film, which is out on Friday, April 6, and comes loaded with exclusive interviews, behind-the-scenes info, and expert insight on the Marvel movie before its release later this month. Interested? Go ahead and subscribe to Total Film right now, and you'll have a copy of the smarter movie magazine delivered to your own home every month, complete with a special subscriber's cover that can't be found anywhere else. And if that isn't enough MCU goodness for you, check out the best Marvel movies with our rundown of every MCU film ranked from best to worst.